Diane & Jeffrey » Happy Halloween! 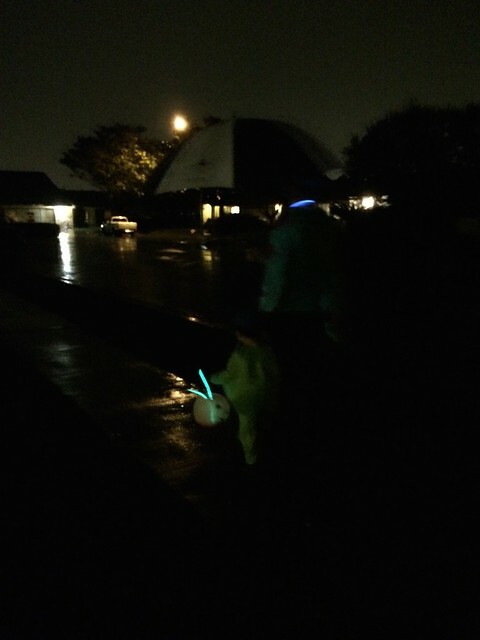 Rainy Trick-or-treating this year. 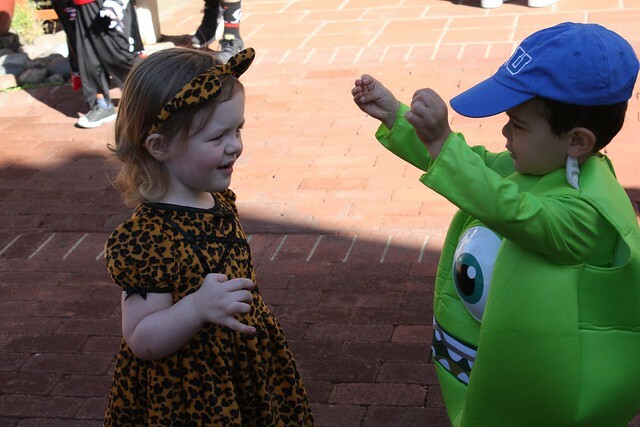 This year we decided to dress up as Disney/Pixar Monsters, Inc. Vincent actually is Mikey from the pre-quel, Monsters University. 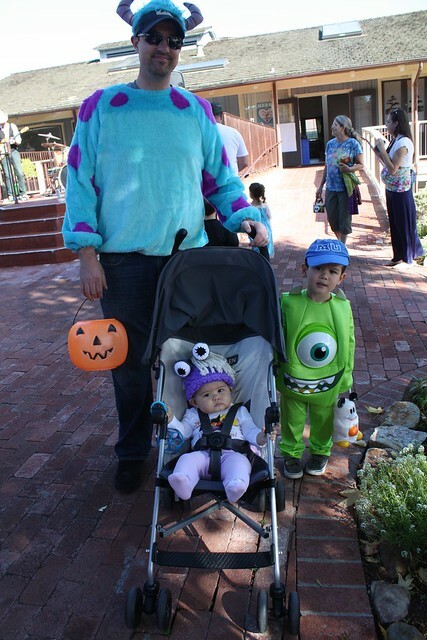 Jeff is Sully, I’m Celia, and little Melanie is Boo! I bought the boy’s outfits on Amazon, and the hats for the girls were from two different Etsy shops. 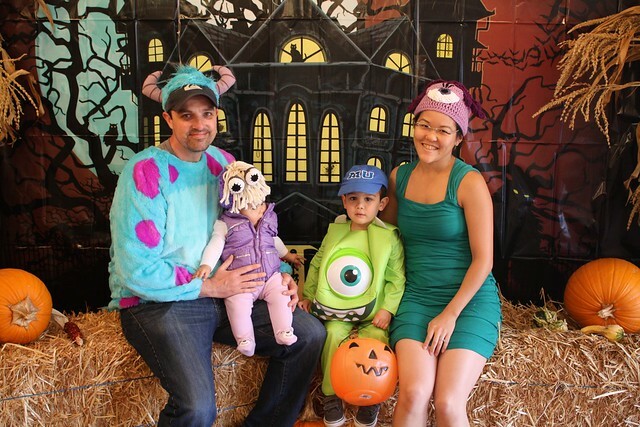 We went trick-or-treating on Sunday at the Barnyard like we did last year with our friend Kyle and Bonnie and their daughter. 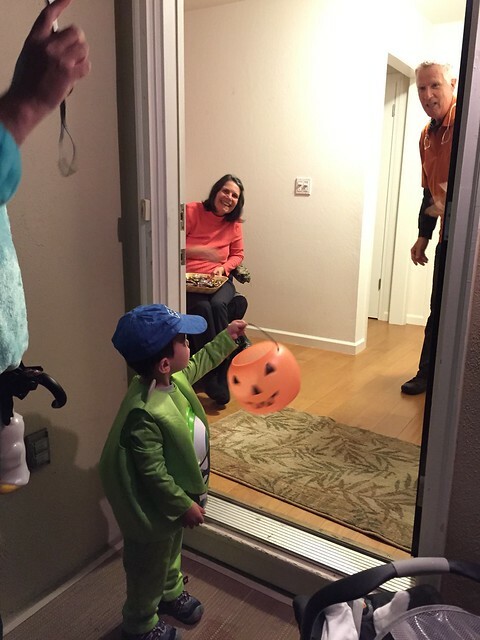 There were a lot of great reactions from people on our family costume. 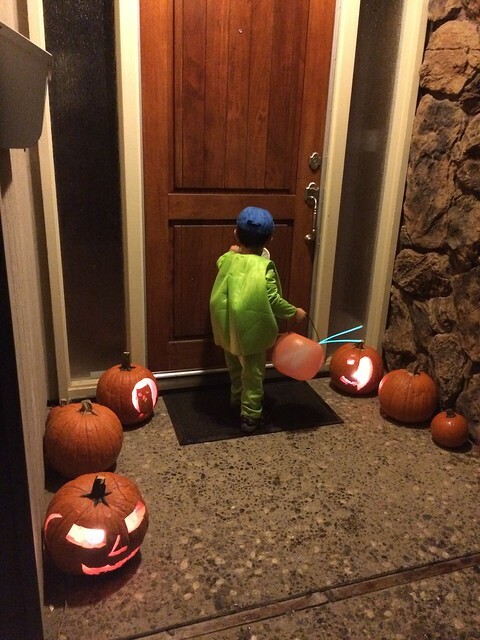 Vincent got the hang of the trick-or-treating. 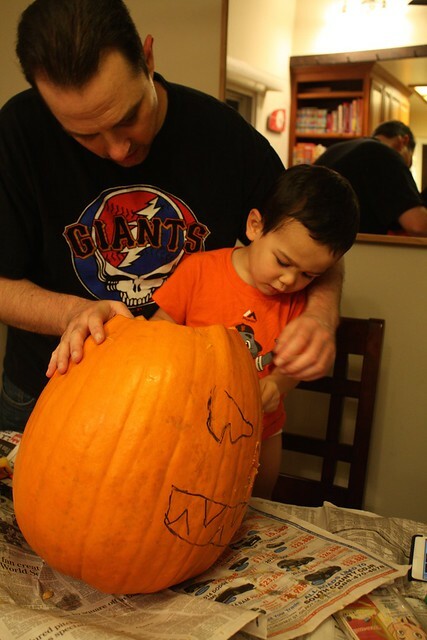 We carved pumpkins one night while watching the Giants in the World Series. Vincent is learning all about pumpkins and halloween at school. He even knows a halloween song! Its cute when you ask him to sing it. On Halloween night, it rained really good. Our plan was to do the wagon again this year, but since the rain, we just decided to drive over to Pop-pop and Oma’s. We left Melanie with them, then trick-or-treat around their neighborhood. We went around one really long cul-de-sac. We used glows ticks, which was helpful in the dark. We probably hit up about 10 houses. Vincent rang on the doorbell and knocked. 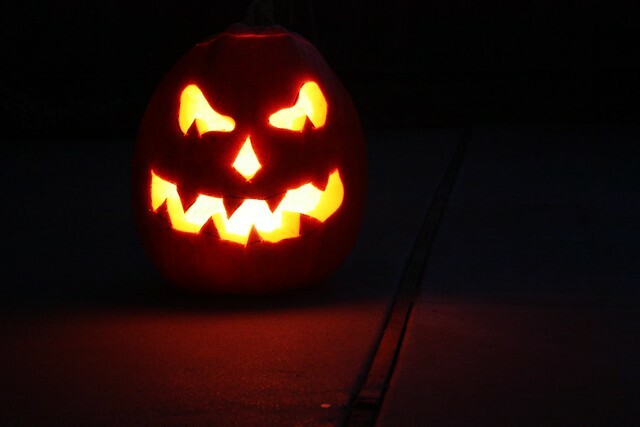 He did well at saying Trick or Treat, Happy Halloween, and Thank You, He held his jack-o-lantern the whole time. 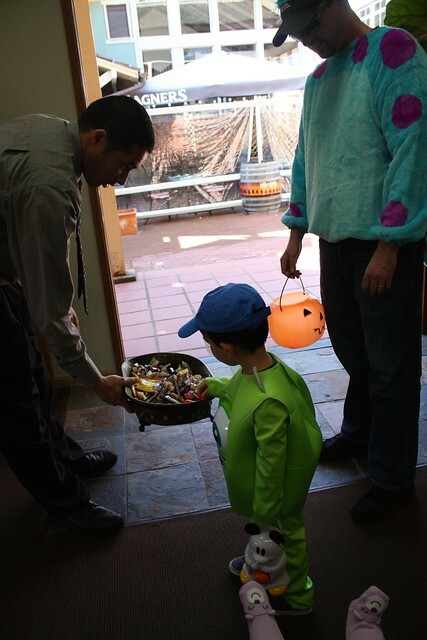 A few people really took pity on him and gave him extra candy. 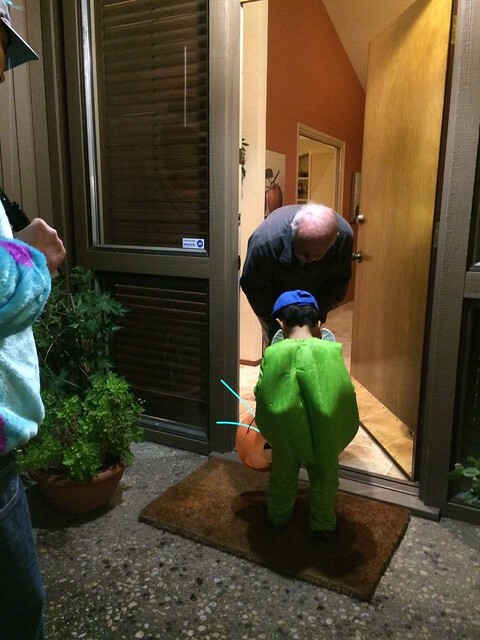 Also, there were not any other trick-or-treaters out! Guess we’re pretty hard-core. 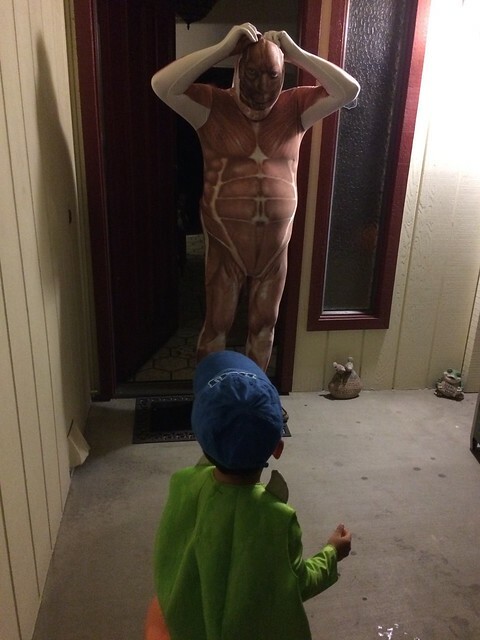 We also got a surprise from one house — a man dressed in one of the skin-costumes. 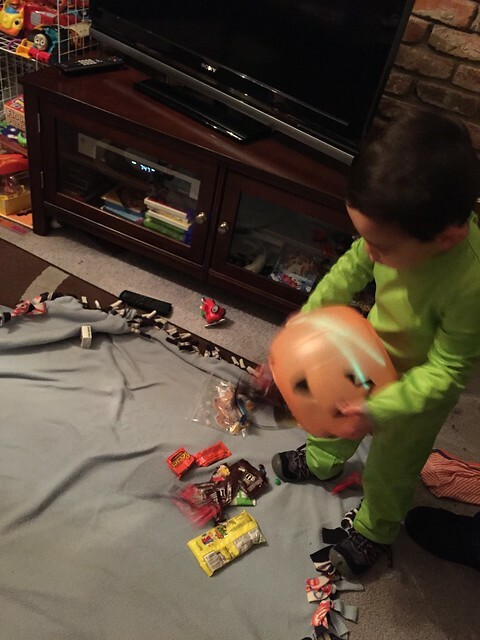 He was scared at first, but warmed up to grab the candy. But then! His wife jumped out behind him and scarred Vincent for life! Poor dude. That pretty much ended the night. Glad we didnt go to that house first! I was laughing. We noticed when we got back though that a lot of his candies were wet and not really appetizing looking. 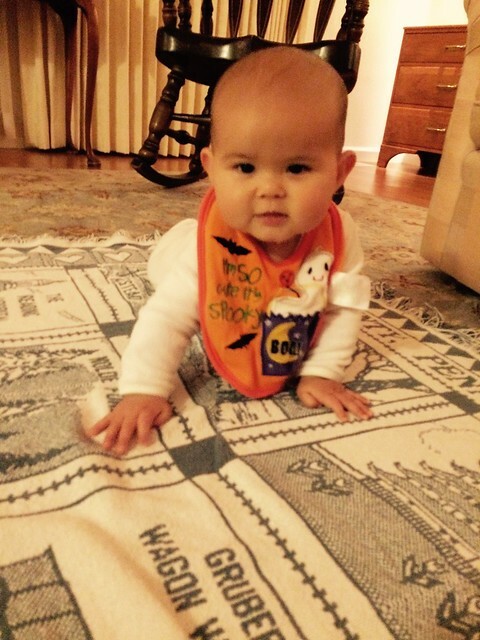 Whenever Vincent wants candies to eat now, he says “trick or treat”! « Visiting the Pumpkin Patch!